Today’s Perfect Picture Book serves two purposes: it’s a great story – one with that folktale flavor I love – but it also carries an anti-bullying message and as such is a wonderful choice for this month which is National Bullying Prevention Month. Brief Synopsis: The happy moon is deeply hurt by cruel words from the sun. She takes them to heart and the resulting sadness causes her to shrink away. Fortunately, her kind friend Comet is worried and sends her to Round Arms who helps her see her true worth, how loved she is, and that one should never listen to the mean words of a bully. Her confidence restored, she once more graces the sky. Links To Resources: The back of the book itself has a “Creative Minds” section which lists information and activities related to the phases of the moon and how to deal with bullies, a List Of Related Websites from Sylvan Dell, Teaching Activities from Sylvan Dell, Comprehension Quiz from Sylvan Dell, Math Quiz from Sylvan Dell. Why I Like This Book: The book is written in the style of a Native American folktale. 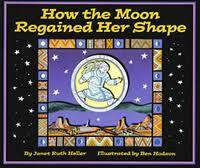 It is both a story about how bullying can hurt someone and an explanation for the phases of the moon. The two are woven beautifully together. The art has a southwestern feel to it and suits the story perfectly. This book has won a number of awards, including a 2006 Book Sense Pick, a 2007 Children’s Choice, a Benjamin Franklin Award for art in 2007, and a Gold Medal in the Moonbeam Children’s Book Awards 2007, all with good reason! It is a lovely, gentle story with a subtle, important message. Sorry you have to twist your neck this way and that to see! Now, if all you lovely PPBF bloggers would kindly leave your post-specific link in the list below, we will all come visit you and see what fabulous offerings you have for us this week! Have a wonderful weekend, and don’t forget to tune in Monday for an interview with Natasha Yim and a giveaway of her new book, Sacajawea Of The Shoshone! The bookmarks are wonderful! I would love some to pass around. Just let me know what you need from me. This picture book really does fit the bullying aspect. It is kind of interesting, but I don't think I'd ever considered the waning and returning of the moon in such a way. Which is why I adore writers putting great folktales to pen to share the stories with the world. How the Moon Regained Her Shape sounds like a very unique book. Sometimes I am amazed at the cleverness of writers! I'm adding this to my library list. The bookmark is awesome! Perfect! I love that you included a QR code…very handy and techy! I will email you my address because I would love to have some to hand out! A fascinating take on bullying and Native American culture! I would love a few bookmarks, Susanna…10 or 15 maybe?? If you don't have my address from last time, let me know. Your selection today sounds amazing, Susanna… I love folktale type stories as well! And I'd LOVE to get some bookmarks… I have a favorite librarian at my son's school that I am sure would be happy to give them out. Currently, they hand-make bookmarks from colored paper and leave them at the check-out desk. Kids love those, so I can imagine they will eat these up!! I'll email you my address… thank you!! Love, Love, love the bookmarks and I would dearly love some. I”ll email my address. I also love and adore folktales so this book is definitely one I should familiarize myself with and think your idea of opening the blog hop in the library is a fantastic idea. 🙂 Maybe once I get a tablet I'll do just that so I can read all the good books right there as I find out about them from our friends on the hop. Sounds like a lovely read, Susanna. I will definitely look for it in our library, which thankfully opens before noon most days! I really like Native American because they always have a wonderful message. But, this is an interesting message about bullying — the sun bullies the moon. Very clever way to get the point across. I love reading retold (or invented) folktales. This sounds like a great story. And I LOVE stories about the moon, too. I missed posting for PPBF today but will be back next week. A good story and a good suggestion about beginning the day at the library. I'll email you about the bookmarks. Now to try to figure out how many bookmarks I want. Gazillions comes to mind… I talked to a woman in the library (just a patron, not an employee) the other day, and wished that I had a bookmark to give her. Instead I wrote down my blog addy for her, and suggested she check it today, and follow the link to your list. I hope she does! Handing out a bookmark will be WAY easier! Sounds like a lovely book, interesting that its a folktale type. Love the bookmarks. Will take 50. I love this book! Beautiful images combined with a great message about bullying and how to persevere. What a lovely book, Susanna…I'm always happy to add titles to my list of stories that address bullying…this one is great because it is so unique and also because it is for slightly older kids. Native American folktales bring home to us the wisdom that was part of that culture…perhaps we would not have our environmental woes of today if we could live with nature as they did. Yes, I could LIVE in the library, I think…I used to want to when I was young! And I'd love some bookmarks…I would give them to kindergarten teachers when I do school visits and also to our local librarians. Please let me know if you need anything from me…I know you have my address…how about something to defray the postage cost? So glad you like the book, Vivian. I LOVE folktales of all kinds – I don't know why exactly but they really appeal to me. If you let me know how many book marks you would like – 5? 10? 20? more? – I will send them along in due course 🙂 I wanted to get an approximate idea of how many were wanted before I ordered, becauser the more you order at once the better price you get. Also the language is lovely – witness the opening. It's really a wonderful book! It's really well done. I love stories like this that explain something in nature. I think I could use this book today. No, I have not been bullied (lately! ), but the clouds are gloomy, and I know we are fast approaching the darkest night in October. The library IS my second home, and sure I would take and distribute bookmarks! Glad you like the look of this book – It's really a good one! And you are excused – you were busy at NWR today! Loved your poem and post! It's really nicely done, Pat. I think you'd like it! They should have it – it won a bunch of awards! And yeah, we live in the backwater here. On Wednesday the library doesn't open until 4!! This book sounds like a unique take on the bullying theme. Sylvan Dell always does a great job thinking through resources and how their books will be used. I would definitely take a handful of bookmarks…I have explained the PPB list to my kids' teachers but it would be nice to have something to hand them. Lest you think I'm that organized, I must assure you that I don't have all the Fridays up to November 16th planned, just the 16th itself, because I'm doing a book in honor of my Mum that week. That looks like a beautiful book! I love the opening lines- so evocative. This book would be a lovely addition to our “space” library. We have lots of facts-based books but nothing narrative like this. It is lovely, and very folktale-y, with very artistic paintings! I know – aren't they lovely? The story is told so simply but lyrically – really nice! Sounds great, Saba. Let me know how many you want as soon as you can – the address can wait, but I'm trying to put together the order. It is a wonderful book, Amy – I think you'd like it. And just give me an idea how many bookmarks you want – I'm putting the order together – 5? 10? 20? 50? I know… I love this time of year – so beautiful! – but I don't love the darkness of winter which follows! Glad you want some book marks – the more we spread the word the better! And I think you'd like this book – it's really lovely. It is a wonderful book, Jarm. I think you'd enjoy it. And thanks for wanting bookmarks! I'm so glad so many people are willing to help spread the word! This book is very well done – one of those, “I wish I'd thought of that!” books! Glad you want some book marks! I think it will be great if we can get more people to make use of this resource! Me too, Angela, and this one works particularly well! Love the book and the bookmarks! Glad you like it, Lori! I totally agree. I think I'll do that library thing one day! Put me on the list for the bookmarks! 🙂 They look AWESOME! Your PPBF choice sounds wonderful. I've never heard of this one. I will have to check out the library. How could the book marks not be awesome with your gorgeous drawing on them? 🙂 Please let me know how many you'd like – I haven't placed the order yet. And this is a lovely book – I hope your library has it!